Gampopa (1079-1153), also known as Dagpo Lhaje («physician from Dagpo») and Dakpo Rinpoche («Precious Master from Dagpo»), founded the Kagyu school, one of the four major schools of Tibetan Buddhism. In many ways the establishment of the Kagyu school marks the beginning of the distinct institution we now recognize as Tibetan Buddhism, even as the Indian Tantric Buddhism model that inspired it faded away. 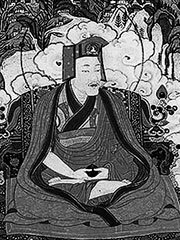 Gampopa, a physician from Dagpo region in Kham, was the foremost student of the Tibetan Buddhist teacher Milarepa. Gampopa was renowned for the clarity of his perception and his knowledge of both kadampa and, later, mahamudra methods. Naropa (1016-1100), who perfected the methods of accelerated enlightenment, described in his six yogas of Naropa. This lineage sequence, taken together, is called the «Five Founding Masters» by the Kagyu followers. Prior to studying under Milarepa, Gampopa had studied the kadampa traditions, which is a gradual path based on the lamrim teachings. He searched for, and eventually met Milarepa, and attained realization of ultimate reality under his guidance. Gampopa wrote The Jewel Ornament of Liberation and founded the Dagpo Kagyud school in 1125. This school merged with the older but less influential Shangpa Kagyud school, founded circa 1050, also dependent on Naropa), to form the major Kagyu school. While the Shangpa school was the first Kagyupa school, it was the integrative teaching of Gampopa which unified Kadampa and Mahamudra teachings into the Kagyu approach.